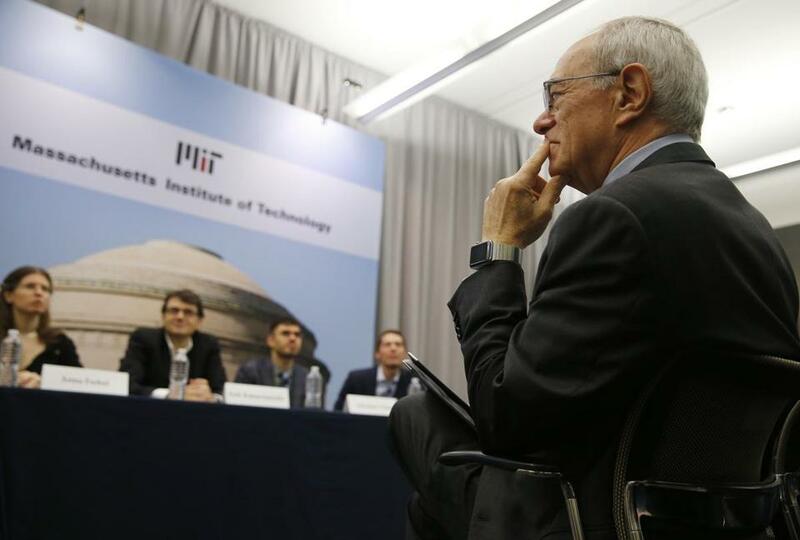 MIT’s president, L. Rafael Reif, listen to a panel discussion at the school in 2017. MIT won’t sever its financial and research ties to Saudi Arabian government groups over the brutal killing of a journalist, despite the urging of many faculty and students, and complaints by some of the university’s female researchers that they face more restrictions than their male colleagues when working in the Saudi kingdom. On Wednesday, MIT president L. Rafael Reif denounced the behavior of the Saudi regime for violating human rights but rejected calls to unilaterally pull out of engagements in the Middle Eastern country. MIT needs to provide faculty autonomy to decide whether they want to remain on current projects, and the school can’t abandon those in Saudi Arabia, including alumni, who are trying to modernize the kingdom, Reif said. Like several other research universities in the United States, MIT has fostered a variety of partnerships with the oil-rich nation. Saudi students come to MIT to study, and organizations and individuals tied to the Saudi government have funded some of the university’s research on oil and gas technology, public health, and climate change. But these relationships were called into question last fall after Khashoggi, a dissident journalist who wrote for The Washington Post, was tortured and dismembered inside the Saudi Consulate in Turkey allegedly on the orders of the Saudi crown prince, according to US officials briefed on the matter. Earlier last year, MIT hosted Crown Prince Mohammed bin Salman and his entourage, including a guard later allegedly involved in Khashoggi’s killing, at its campus. Critics have also pointed out that even before Khashoggi’s murder, the Saudi government’s involvement in a civil war and humanitarian crisis in neighboring Yemen should have given MIT reason to reconsider its partnerships in the kingdom. Still, Reif’s decision was expected. An internal report completed in December recommended that MIT maintain its ties to Saudi Arabia but consider more rigorous review of future partnerships. Reif echoed that conclusion, pointing out the benefits of the longstanding collaboration, including fellowships that allowed Saudi female doctoral students to come to MIT for their study. Saudi-tied funds provide a variety of support to MIT. MIT has accepted at least $25 million from Saudi Aramco, the state oil company, since 2012, using the money to launch the MIT Energy Initiative, which is focused on developing clean and renewable energy. Last fiscal year, the university received $7.2 million in sponsored research support, which backed 48 principal MIT researchers. The university also derived another $1 million in fee income by connecting Saudi businesses with MIT experts and providing coursework for business executives in the kingdom. Revenue from Saudi government agencies, universities, and government-owned entities accounted for 0.2 percent of MIT’s operating budget, university officials said. Reif said he would leave it to individual researchers to decide whether they want to be involved in the Saudi engagements. Those who choose to disengage will be helped in the transition by MIT. So far, none of the lead researchers have asked to be removed from the Saudi-tied projects. Some of the past projects, however, have been problematic for MIT’s faculty, according to comments submitted in recent weeks by members of the university community. Some researchers said they could not participate fully and equally in activity. In one case, where MIT researchers had to travel abroad, they said they were required to “hide certain aspects of their identity. . . . In a variety of settings female MIT faculty researchers were not accorded the same civil rights as their male faculty colleagues,” according to a report summarizing more than 110 comments received by the university in recent weeks about the Saudi relationship. While only about 4 percent of the faculty submitted comments, a majority urged MIT to cut ties. Through the comments they received, MIT officials said they learned that in some cases women participating in workshops or conferences in Saudi Arabia have not been able to fully take part in social events connected to the programs. Richard Lester, an MIT associate provost, who spent the past few months reviewing the university’s Saudi ties, said that in cases where there will be restrictions, the lead researchers should explain to a reviewing committee why the project is still viable. MIT’s more aggressive review of Saudi-funded engagements will be tested soon as its contract with Aramco comes up for renewal.